Leprechauns and St. Patrick’s Day go together like peanut butter and jelly. So, why not gather the kids around the table and make some of these fun leprechaun crafts for kids? Who knew that there were do many different ways to make Leprechauns?! Check out these fun Leprechaun crafts for kids ideas below. I am sure you will find at least a few that you already have all the materials for right at home. Before you know it your house will be covered in these lovely St. Patrick's Day decorations! I Heart Crafty Things shows you how to turn a regular envelope into a cute leprechaun craft puppet. Who doesn’t love crafting with puffy paint? Your kids will love making this Puffy Paint Leprechaun craft. Kids will love this St. Patrick’s Day Craft that is made with just empty toilet paper rolls, paper, cotton balls, paint and glue. Kids love putting their hands in paint, so you know they are going to just love making this Handprint Rainbow and Leprechaun. Paper, googly eyes and glue is all that is needed to make this adorable Paper Leprechaun. This fun and easy Leprechaun craft uses paper plates and tissue paper. Create a festive Leprechaun complete with interactive changing emotions! This is truly a one-of-a-kind education St. Patrick's Day craft. This fun paper plate Leprechaun craft uses puffy paint for the Leprechaun's hair and beard. 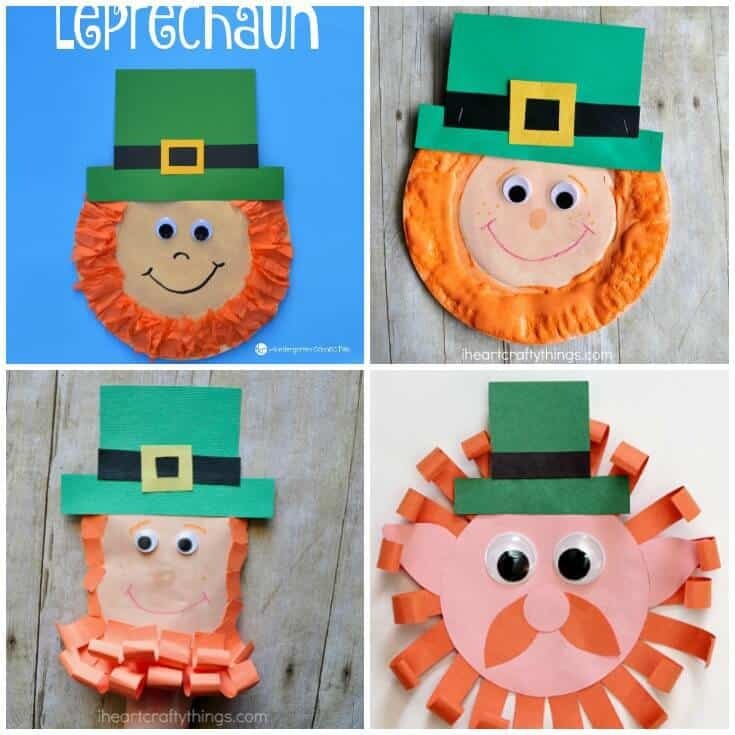 This fun Leprechaun craft helps toddlers to work on their scissor skills by cutting out strips of paper for the Leprechaun's beard. Once the little ones put these cute Leprechaun Hats together they can enjoy wearing them and pretending they are a Leprechaun! 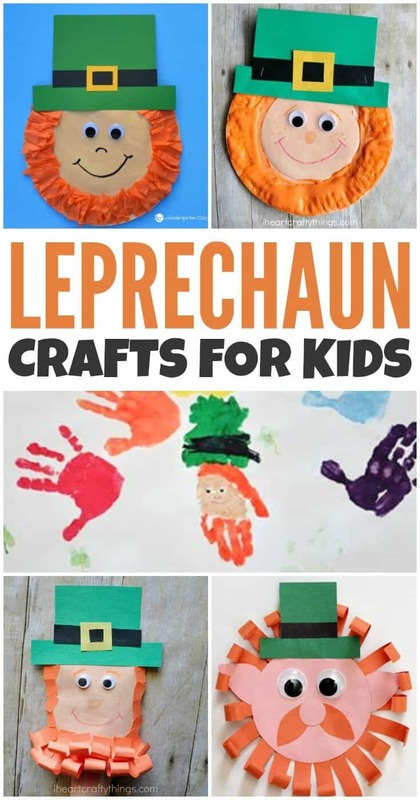 I hope you found a few Leprechaun crafts for kids that you think will be perfect for your little ones. Enjoy your family crafting time and have a very happy St. Patrick's Day! Which Leprechaun craft will you be making with the littles this year? These are all so cute. I love using the paper plates because I have a zillion and they are so inexpensive it is a cheap craft project. Your crafts are super awesome! I never thought of leprechauns as St. Patrick’s Day crafts. The most out teachers had us do were four-leaf clovers. These will be great for kids I sit for. This will make a really great rainy-day activity. Oh, super cute. St. Patrick’s Day is coming up?!? Thanks for posting! These are adorable. Will have to try. These are so super cute.I am always on the lookout for cute crafts to do with my grandchildren. I like the one with the mustache best. All are very fun. These would be great to make with our grandkids. They would love to make these. They are cute and nice little project for the little ones. These are great, we will be having fun making, thanks. I love these craft ideas. My son teaches kindergarten so I pass them along to him. These are all so cute. Since I have a lot of paper plate I shall try those first . I am always on the look out for crafts to do with my grandchildren.We have a kit that we get out that has scissors in it ,crayons and all kinds of craft paper.They will love this one I’m sure.Thank you.